I downloaded the He's Risen! Eggs for our children's message on Palm Sunday and Easter. We will also incorporate a set in our between services Easter Egg Hunt allowing the children who find one of these "special" eggs to trade it in for a prize. Hopefully the children will be able to tell us what the egg stands for by the picture alone in "exchange" for the prize. This is a great family project too! The adults can read the text, while younger children decorate the eggs and older children put the Mobile together--all participants will learn the main theme for each egg. String eggs on to the Mobile during Holy Week. What you need: He's Risen! Eggs, string, small hole paper punch, wooden dowel. What you do: Using colored pencils, markers, or crayons, color the egg patterns, punch holes, string to dowel as pictured, above. On Palm Sunday study all the text for Egg # 1, and then decorate the Egg. 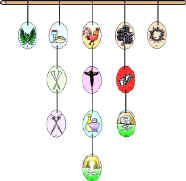 This is the first item to hang on your Holy Week Symbols Mobile. 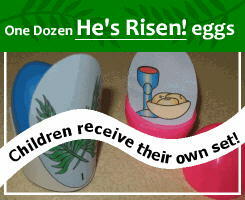 Easter Morning -- Study text and decorate Egg 12 in a glorious way -- add as the "crowning" touch to your Holy Week Mobile!